Are you Team Taco or Team Burrito? These days, I’d probably have trouble picking a side, but I was staunchly Team Burrito throughout childhood. Burritos were actually one of my favorite foods, if there was a burrito on the menu, you bet I’d be ordering it! There is just something so satisfying about burritos, whether handheld or smothered and baked. Breakfast burritos, bean burritos, wraps that pass themselves off as burritos, burritos stuffed with your favorite taco fillings–I love them all! I’m not sure I love photographing them though, haha. Well today I’m sharing a recipe for the kind of burrito I grew up eating, a vegan smothered burrito! When it comes to burritos, I’m not sure there is just one traditional kind. The history of burritos is a bit murky, with the first historical mentions dating back to the late 19th century. But these burritos most likely did not resemble what you think of today–a hearty, overstuffed flour tortilla. 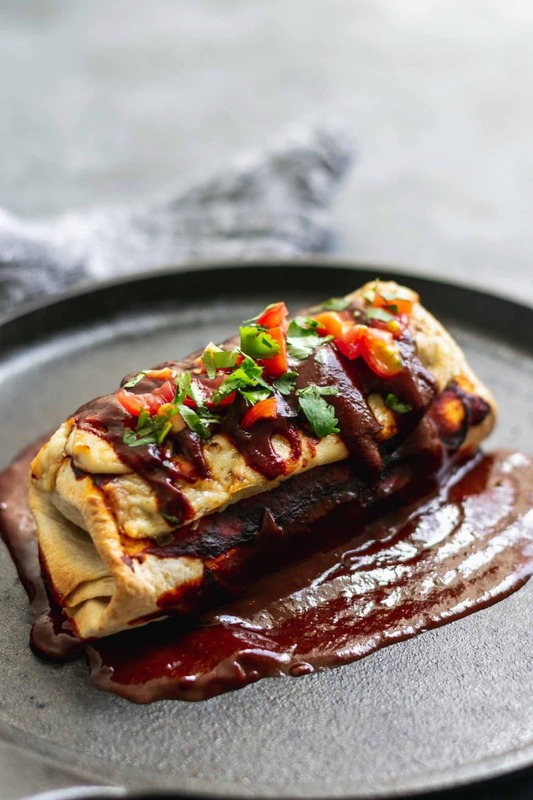 What defines a traditional burrito probably depends on if we’re talking about burritos from Northern Mexico, the Southwestern United States (hello Tex-Mex), or even California. I’m not a burrito expert, despite the rabbit hole of burrito history I just went down. 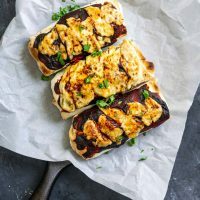 I think of these burritos as “traditional” but they are really just traditional-ish to me and what I grew up eating, and some kind of amalgamation of the various sub-cuisine burritos. Stuffed with homestyle potatoes (a la California burrito), quick refried black beans (Mexican? All of them? ), and a creamy cabbage slaw (American? South American? Dutch? Who knows.) 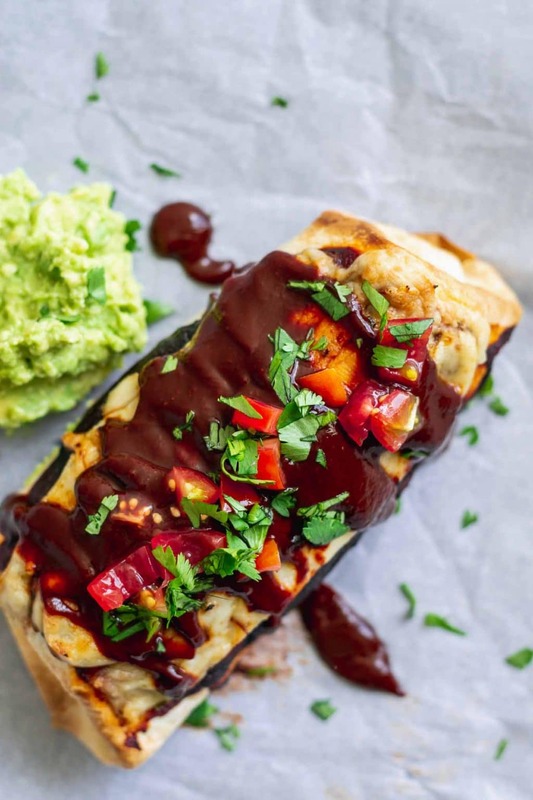 then smothered with Mexican red chile sauce, vegan cheese, and baked–which officially makes this a wet burrito, which is believed to originate from Grand Rapids, MI in the 60s. Actually, as my parents met in the early 70s in Michigan, it makes a lot of sense that smothered (wet) burritos are the ones I grew up with. If you’re like OMG Eva, enough already, I don’t really care that much about the history or origins of burritos, let’s talk about making them already! Ok, ok, I’m moving on! Black beans are my favorite burrito filling (duh), and so for these I’ve made a quick refried beans. Fry up some onion and garlic, add beans and some liquid (the liquid from the can of beans is great, water works too), salt, and either red chile sauce for my favorite version or tomato paste for milder beans. A squeeze of lime juice finishes them off. I like to leave them mostly chunky, and sautéing them breaks them down just enough for a perfect creaminess and stickiness without any need for mashing (we’re all about structural integrity over here, can’t have individual beans spilling out of your burrito as you eat it!). Pan fried potatoes are my favorite starchy burrito filling. They’re the perfect contrast to the spicy, flavorful beans. I like to coat them with a little ancho chile powder or American-style chili powder (the mild blend of spices, not spicy ground chiles) and salt. These potatoes are delicious enough to eat on their own, so try to hold yourself back while you cook the beans! Cabbage slaw isn’t the most traditional of burrito fillings, but I love the crunchiness and cabbage’s peppery flavor. I also love that cabbage is not in danger of going soggy from baking or even in your leftovers. Trust me, you won’t miss that limp shredded lettuce! This 4-ingredient slaw is made with vegan mayo, fresh squeezed lime juice, and a sprinkling of salt for a cooling and tangy cabbage dish. The three filling components are wrapped inside a tortilla, smothered with my homemade Mexican red chile sauce, which you may want to thin with water depending on how thick you made it, and topped with some peppery vegan cheese (store bought vegan pepper jack or cheddar would work nicely as well!) and baked to melt the cheese and crisp up the edges. This burrito is a knife and fork kind of meal. I like to serve mine with some guacamole or mashed avocado and extra red sauce. They’re also delicious with a little vegan sour cream. These are the smothered burritos that turned my Team Taco husband into a smothered burrito lover. Until I made these he insisted that he didn’t like them at all. Eventually I made them for my own enjoyment, and now he requests them all the time! Whether you are already Team Burrito or a smothered burrito skeptic, I hope that you’ll give these burritos a try! Let me know if you make them. Leave a comment below, tag me on Instagram (or #thecuriouschickpea), or share with me on Facebook. Happy burrito eating! How many burritos this makes depends a lot on the size of your tortillas. It should be enough filling for 6 of your average-sized (~12″) tortillas. For giant tortillas it will make less, and for the ones that are between burrito and taco size (you know what I’m talking about) you’ll get more like 8. 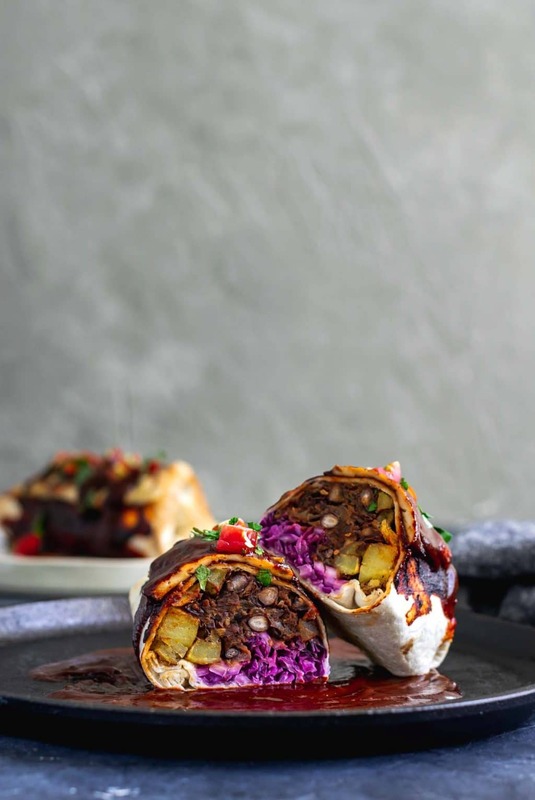 Burritos are filled with homestyle potatoes, cabbage slaw, and delicious easy refried black beans, then smothered with Mexican red chile sauce and vegan cheese and baked until hot. Preheat the oven to 375 ºF. In a mixing bowl combine the cabbage, vegan mayo, lime juice, and salt. Taste and adjust seasoning if desired. Set aside until ready to use. Heat a large skillet over medium heat. When hot, the oil and the diced potatoes. Cook for 5 minutes, stirring occasionally, until the potatoes are starting to brown. Then add 1/2 tsp of salt and the ancho chile powder (or chili powder) and cover the skillet and cook another 5 minutes, or until the potatoes are soft and tender and golden all over. Taste and add more salt if desired. Remove from the skillet and set aside. In the same skillet over medium heat (no need to clean it out), add the oil and the diced onion. Cook the onion for 4-5 minutes, stirring occasionally, until it's lightly caramelized and golden. Add the garlic and cook for an additional minute. Add the black beans, salt, Mexican red chile sauce (or tomato paste for milder beans), and water and cook, stirring occasionally, for about 5 minutes until the beans have started to break down and the mixture turns creamy. Add the lime juice, taste, and adjust seasoning if desired. Turn off heat and assemble your burritos! Add about 1/3 of each the beans, potatoes, and cabbage to a tortilla, how much depends on how large your tortillas are. Fold in two sides of the tortilla to cover the edges of the filling, then lift one of the adjacent sides and roll it over to form a burrito. Place in a baking tray or baking dish and repeat with remaining burritos. 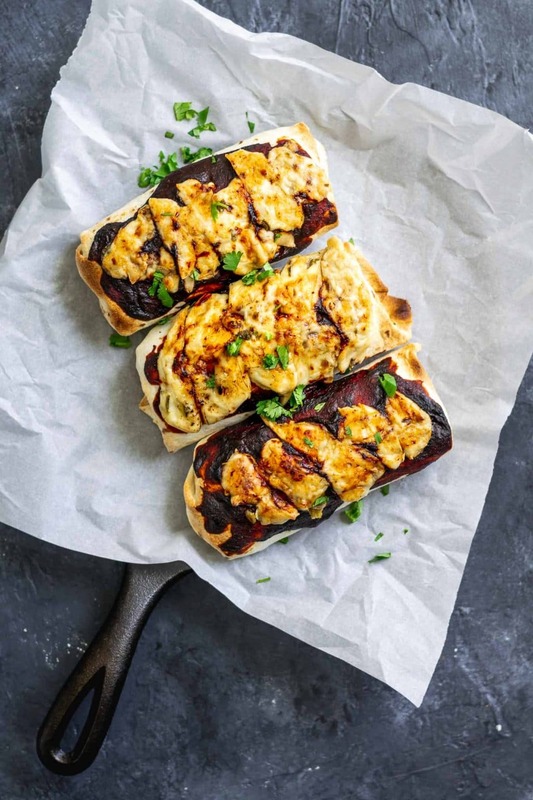 Spread some red chile sauce over the tops of the burritos, and top with vegan cheese. Bake at 375 ºF for about 10 minutes, or until they're hot and steamy. If the cheese needs some help melting, turn the broiler on at the end for a couple of minutes, keeping a close eye on it so it doesn't burn! Garnish with some cilantro or chives/scallion and enjoy the burritos with avocado or guacamole! Sign up to receive updates straight to your inbox! Some links on The Curious Chickpea are affiliate links. This means, if you make a purchase through one of these links I may earn a small commission at no additional cost to you. These links in part monetize my site and allow for free content. Thank you for your support!